OXFORD, Miss. – The Ole Miss women’s basketball team (8-14, 2-6 SEC) fell to Auburn, 64-51, Thursday night in The Pavilion. (Click here for box score.) While the Rebels were able to hang with the visitors for the first half, they saw Auburn use its aggressive defense early in the second half to build an almost insurmountable lead. Initially, neither team shot the ball exceptionally well, as both squads turned in under 35% marks in the first 10 minutes of play. 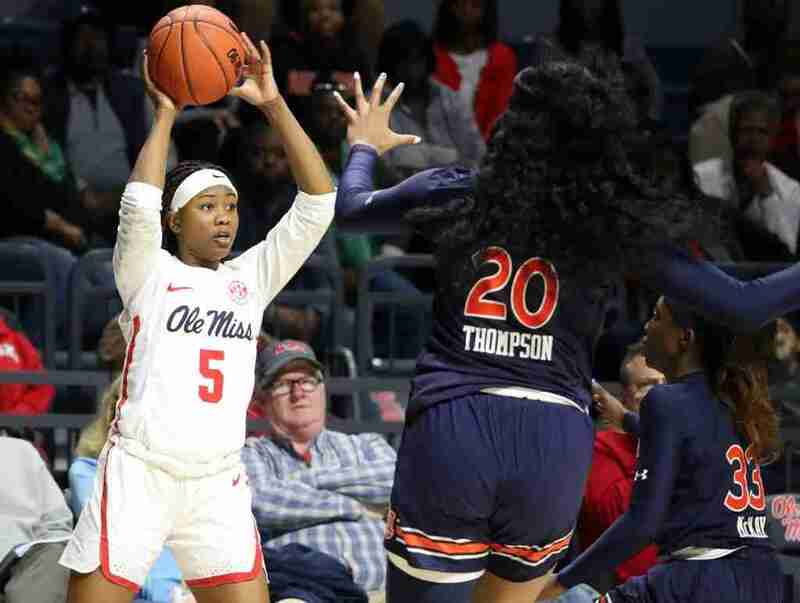 However, despite the poor early shooting from both teams, as well as an early 9-point lead for the Auburn squad, the Rebels were able to cut the deficit to just two points as the first quarter ended in favor of Auburn, 15-13. Just 50 seconds into the second quarter of play, the Rebels grabbed their first lead of the game, courtesy of redshirt senior Shandricka Sessom. A back-and-forth contest ensued for the next five minutes until Auburn pushed the Tigers’ lead to seven. Fortunately for the Rebels, another well-timed run allowed Ole Miss to narrow Auburn’s lead to just three, 27-24, going into intermission. At the end of the first 20 minutes, there was little statistical separation between the two teams, but Ole Miss did lead the battle on the boards, 23-19. So instead of falling into a deeper hole, Ole Miss fought through the last several minutes of the half in order to get to the locker room with a fighting chance. The Rebels came out playing hard in the opening seconds of the second to quickly put pressure on the Tigers’ slim 3-point advantage. Unfortunately for Ole Miss, however, a few untimely turnovers and missed shots allowed Auburn to push its lead back to eight. Coach Yo called an early timeout at the 7:19 mark in the third quarter, but the Tigers soon extended their lead to 15 with just under two minutes remaining in the period. The visiting Tigers continued pressuring the Rebels with tough defense and built their lead to 52-34 as the third quarter came to a close. 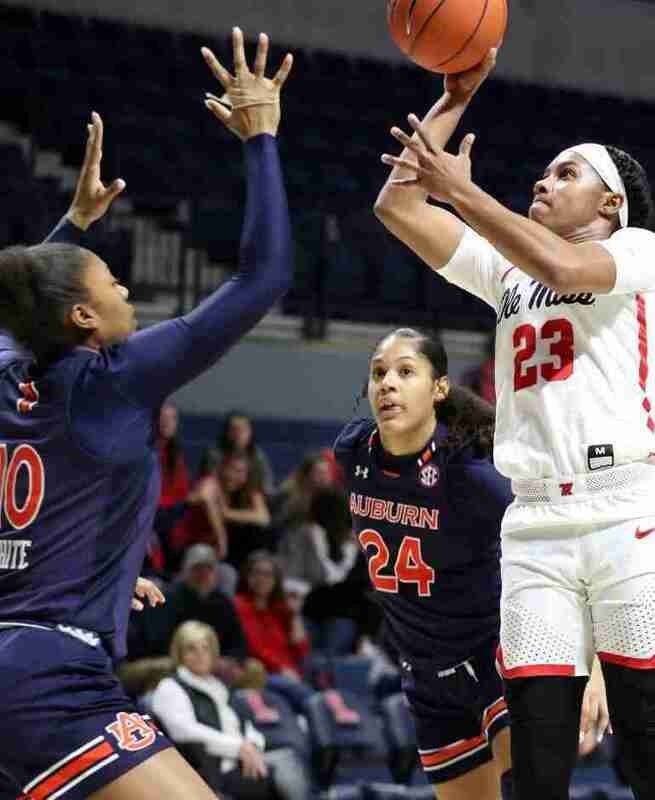 Auburn held its double-digit lead throughout the rest of the contest by turning the Rebels over a total of 11 times in the second half of play. The Tigers regained the lead on the boards as they finished the contest with a 40 to 38 rebounding edge over Ole Miss. 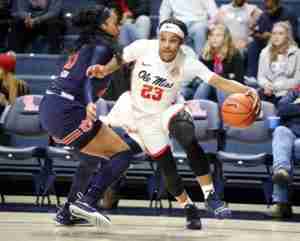 Two Rebels finished in double digits: Sessom and Crystal Allen each notched 16 points on the night. Auburn’s Unique Thompson led the Tigers with 20 points. Coach Yo and her Rebels return to The Pavilion this Sunday to face Texas A&M. The contest tips off at 2 p.m. (CT) and will be televised on the SEC Network+. The game will feature a Pink Out in The Pavilion to honor the fight against breast cancer. The Rebels will don their all-pink uniforms, and everyone is encouraged to come out and wear their pink gear in support.